I think seeing some of the species I work with back safe in the wild can happen in my lifetime, along with the success of many other amphibian conservation initiatives around the world, and that thought will always keep driving me forward. My name is Robert Hill and I’m currently the Lead Keeper of Herpetology at Zoo Atlanta in the USA. I’ve had an interest in amphibians and reptiles for as long as I can remember. As a youngster I would go out as much as I could to catch frogs, snakes, turtles, and pretty much anything I could find. As I grew older I couldn’t shake my interest (or what some might call obsession) in these animals. Any book, article, or documentary highlighting herps of any kind I could get my hands on was like gold, and I kept a number of species of herps (including various frogs) at home for years. Despite all of this, I never realized that there was much of a career as a herper, so I didn’t pursue herpetology outside of a hobby until I was in my mid-20’s and even then, being directly involved in amphibian conservation seemed a distant, abstract concept. It was around that time, while working at a local animal wholesaler, that I ran into an old friend I hadn’t seen for some time. Many of you reading this are likely familiar with his name, Ron Gagliardo. Thankfully, Zoo Atlanta had also recently hired a new Curator of Herpetology by the name of Joe Mendelson. Ron, being the networking guru he is introduced me to Joe and as soon as possible I applied for a position as a herp keeper. That was the best opportunity I could have ever gotten. Aside from being able to work with a massive collection of animals and some awesome people, I had the opportunity to travel to Panama in July 2006. The reason was unfortunate as it was to assist with husbandry of rescued amphibians from the El Valle de Anton region that was being ravaged by amphibian chytrid fungus. However that experience would change my life forever and bring me fully into the amphibian conservation fold. Eventually I left the zoo for a position in the Atlanta Botanical Garden’s Research and Conservation department. Working there really opened my eyes and allowed me to grow exponentially. The number of tropical frogs I was able to gain experience keeping, breeding, and rearing was incredible. Many of these were from El Valle and I became even more involved in the efforts in Panama, including helping with the construction of the El Valle Amphibian Conservation Center. In addition, I was allowed to follow my interests in native amphibians from Georgia through field studies of emergent amphibian diseases (focusing on plethodontid salamanders), population assessments, and head starting. I left the garden after nearly five years to go back to Zoo Atlanta, where I’ve been able to grow even more. Since returning, I’ve continued my involvement in many of these projects as well as many others. 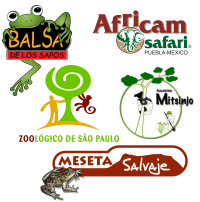 I was recently named fundraising coordinator for Project Golden Frog, which works to keep captive assurance colonies of Panamanian Golden Frogs (Atelopus zeteki) with the ultimate goal of reintroduction into their native habitat. Despite the number of times I was able to visit Panama, I never got to see a Golden Frog in situ. Hopefully through Project Golden Frog’s efforts, maybe one day I can. Throughout the years I’ve been able to participate in a number of amphibian conservation focused projects, including a head-starting effort to establish a new population of Gopher Frogs (Lithobates capito) at a restored site in southern Georgia. This project has been a major high point in my career. Very often working with captive animals you don’t get to see them return to the wild, but through this effort (which includes the Georgia Department of Natural Resources, University of Georgia, The Nature Conservancy, Atlanta Botanical Garden, and Zoo Atlanta) over 5,000 Gopher Frogs have been released and there has been evidence of reproduction at our release site. I’ve also worked on population and emergent infectious disease surveys of Eastern Hellbenders (Cryptobranchus alleganiensis alleganiensis), helped conduct stream salamander studies, and been able to see some incredible amphibians doing what they do in the field. I look forward to continuing with these projects and hope to be involved in many more in the future in the southeast and abroad. I hope very soon that we can stop rearing Gopher Frogs for release and to see Panamanian Golden Frogs signalling to each other in the cloud forests of Panama instead of in glass boxes. 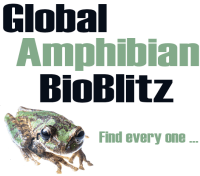 I think these things can happen in my lifetime, along with the success of many other amphibian conservation initiatives around the world, and that thought will always keep driving me forward.